Seafood is naturally low in saturated fat. Despite popular belief foods high in natural cholesterol, like eggs and prawns, DO NOT have an effect on our own bodies’ cholesterol levels. That means good news for all of you wanting to keep an eye on your blood cholesterol – you can still enjoy these tasty high protein foods (but keep watching out for saturated fat which has much more of a negative effect on your cholesterol levels. This tastes great served with some garden peas, steamed mange tout or other green leafy vegetables like spinach, kale or broccoli and this will add in some extra fibre and vitamins too. 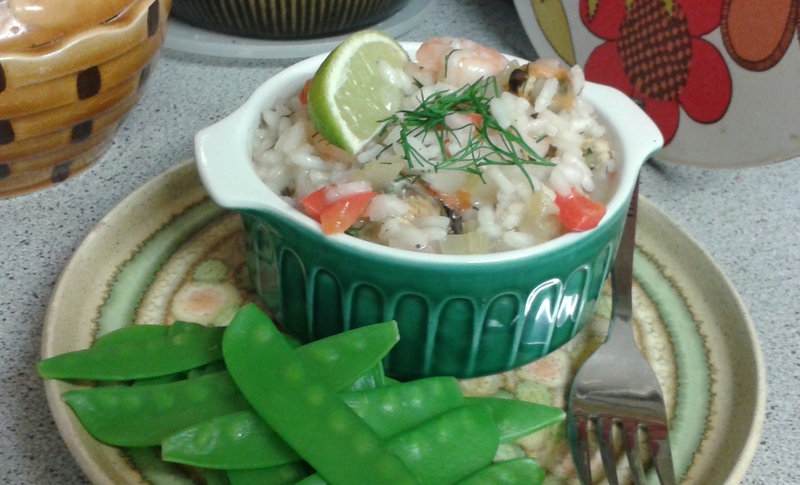 You can add any combination of seafood you like – try cockles, whelks, white fish or salmon as an alternative to any of the seafood I have suggested. Prepare and chop all vegetables. Zest and juice the lime and set both aside separately for later. Make the fish stock and mix in a large jug with the white wine and lime juice. Heat the oil in a large frying pan or wok over a medium heat. Fry garlic, chilli, onion and pepper for 8-10 minutes until slightly browned, stirring all the time to prevent burning. Add the Arborio rice and fry for a further 2 minutes. Add a little of the stock mixture at a time, stirring constantly. Allow the rice to absorb the liquid before adding more stock. 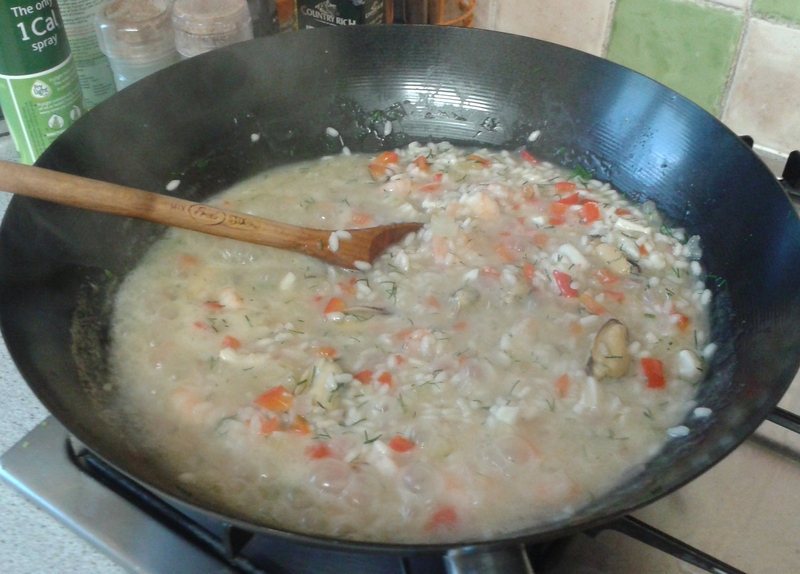 When you have added about ¾ of the stock, add the seafood and stir through. Continue adding the stock liquid a little at a time until the rice is plumped up and the liquid starts to form a creamy consistency. This may take 15-20 minutes, from start to finish. Stir in the lime zest and dill and black pepper to taste. Serve with a side of green salad, garden peas or steamed mange tout.